Summary:Links to water storage resources elsewhere on the web, as well as suppliers and references. Caution: While most of the resources cited here are excellent, these listings have not been screened. Ferrocement and Laminated Cemititious Composites, 2000. Antoine E. Naaman, Ph.D., 372 pages; 160 figures and illustrations; 43 pages containing 120 photographs; design aids; bibliographic references; 7.25x9.5 in. Ferrocement.net Information on all aspects of ferrocement. Society for Protective Coatings Non-profit association focused on the protection and preservation of concrete, steel and other industrial and marine structures and surfaces through the use of high-performance industrial coatings. Information on surface preparation, coating selection, coating application, environmental regulations, and health and safety issues that affect the protective coatings industry. 1Principles of Ecological Design Art Ludwig. Oasis Design. Principles for redesigning our way of life to live better with less resource use. See description on inside back cover and free online summary at www.oasisdesign.net/design/principles.htm. 4Water Quality Testing Procedures and Information Packet Art Ludwig. Oasis Design. A set of downloadable files which will help you learn water testing techniques and interpret results. See inside back cover, also www.oasisdesign.net/water/quality/coliform.htm. 5American Journal of Public Health, Robert D. Morris. 1992. 6Water Storage Extras Oasis Design. Includes Water Tank Calculator, Research notes on materials leaching, bacterial regrowth, disinfection by-products, permeation, and water system component spreadsheet. See inside back cover and www.oasisdesign.net/water/storage. 7NRDC's March 1999 petition to the FDA Includes report on the results of their four-year study of the bottled water industry, including bacterial and chemical contamination problems. The petition and report find major gaps in bottled water regulation and conclude that bottled water is not necessarily safer than tap water. See www.nrdc.org/water/drinking/bw/bwinx.asp. 8National Testing Laboratories, Ltd. Network Phone 440-449-2525 or 800-458-3330, Fax 440-449-8585. www.ntllabs.com. Offer a $130 water test for 75 parameters. As detection limits are disappointingly high you are unlikely to find anything unless the water is really bad, but the price can't be beat. 9Builder's Greywater Guide Art Ludwig. Oasis Design. www.oasisdesign.net/greywater. 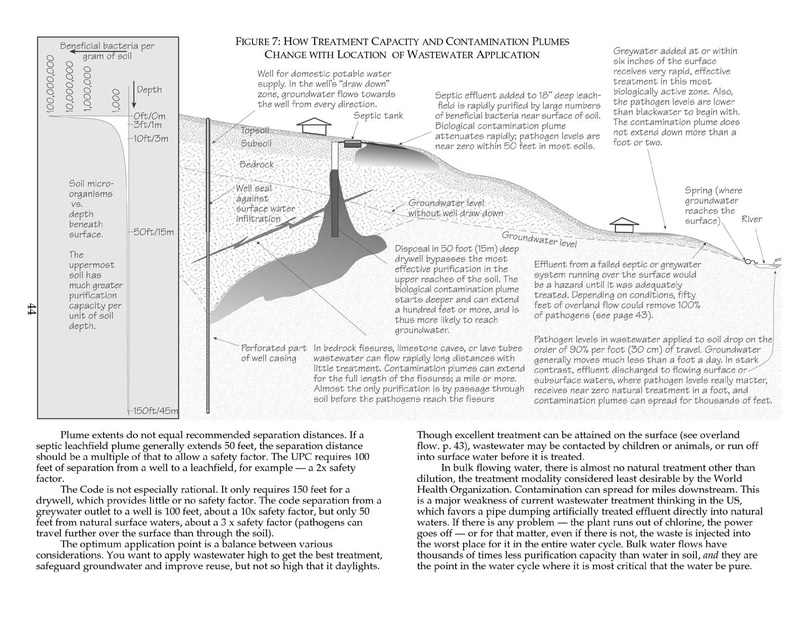 Figure 7, p. 43: How Treatment Capacity and Contamination Plumes Change with Location of Wastewater Application. 10Ponds--Planning, Design, Construction The USDA Natural Resources Conservation Service (NRCS), Agriculture Handbook 590. Call your local Natural Resources Conservation Service office to get a copy. 12Pond Construction: Some Practical Considerations Virginia Cooperative Extension, Fisheries and Wildlife, 1997 PUBLICATION 420-011. 14Solutions to Common Fish Pond Problems L. A. Helfrich, Extension Specialist. Fisheries Virginia Tech. Publication Number 420-019, 1999. 15Natural Swimming Pools/Ponds -- The Total Guide Total Habitat. www.totalhabitat.com. Designers & Builders of Natural Swimming Pools/Ponds. 16A Handbook of Gravity Flow Water Systems Thomas D. Jordan, Jr. Intermediate Technology Development Group. 1980. Portions of Sizing Water Tanks section and comments on stone tank shape are paraphrased from this work. For stone tanks they suggest octagonal tanks for diameters less than 2.5 m, hexagonal shape for tanks of at least 2 m and square tanks for small capacities. Includes procedures for welding HDPE water lines. 17Effects of Water Age on Distribution System Water Quality American Water Works Association. Figure adapted by permission. 18Rainwater Catchment Systems for Domestic Supply John Gould and Erik Nissen-Petersen. Intermediate Technology Publications, 1999. Tank sizing figure adapted by permission. 19Water Distribution Systems Handbook Larry W. Mays. American Water Works Association, 1999. 21Paul Kemnitzer, Hollister Ranch 51, Gaviota, CA 93117. Tel 805 451-5153. Ferrocement pioneer, and builder of quality ferrocement water tanks, homes and structures in Southern California since 1982. Tanks from 3000-100,000 gal (11-380 m3), cylindrical or boulder-shaped, in natural colors. 22Pacific Gunite, Box 421, Mountain View, HI 96771. 808-968-6059, Fax 808-968-8668, www.pacificgunite.com/. Cylindrical tanks from 1000-50,000+ gal. 23Report of the New South Wales Chief Health Officer, 1997 www.health.nsw.gov.au/public-health/chorep97/env_watalum.htm. 25Water Bladders in Culverts Earthwrights Designs. 505 986-1719, I suggest you avail yourself of Earthwright's experience if you want one of these. They use aluminized steel culverts with 30 mil PVC inside geotextile, or PP bladders. Cost is about $1/gal installed, capacity 10-50k gal. There is limited access for cleaning. First ones installed in 2002. 27Maruata en el Cruce de Caminos Art Ludwig. Oasis Design. Ecological systems designs for an indigenous community in Mexico, including water supply and sanitation. See www.oasisdesign.net/design/examples/maruata/book.htm. 28Oxidation of Iron and Manganese www.fcs.uga.edu/pubs/PDF/HACE-858-11.pdf Iron and manganese dissolve more readily deep underground, in the absence of oxygen. As water is pumped to the surface and exposed to oxygen, the process will reverse and the dissolved iron and manganese will precipitate out of the water forming colored sediment. Iron sediment is reddish brown or orange; manganese sediment is black or dark grey. See also www.healthgoods.com/Education/Healthy_Home_Information/Water_Quality/iron_manganese.htm. 29Non-modulating Float Valve CLA-VAL Automatic Control Valves. P.O. Box 1325, Newport Beach, CA 92659. 800-942-6326, Fax: (949) 548-5441. www.cla-val.com. Highly reliable, but expensive. 1/2" valve costs $450 supplies 19 gpm; enough for most systems. Rebuild kit is $94. 30Watermaster 1016 Cliff Drive #321, Santa Barbara, CA 93109. 805-966-9981, Fax 805-705-5813. Source for ozonators, water treatment consulting, equipment selection, and installation. 31Information on sand filters See www.oasisdesign.net/water/treatment/slowsandfilter.htm. 33National Fire Protection Association States sprinklers "reduce chances of dying in a fire and the average property loss by one-half to two-thirds compared to where sprinklers are not present. NFPA has no record of a fire killing more than two people in a completely sprinklered public assembly, educational, institutional or residential building..."
34Surface Water Treatment Rule US Environmental Protection Agency water.epa.gov/lawsregs/rulesregs/sdwa/swtr/. 35National Drinking Water Clearinghouse Skilled help for small communities to run their water systems. 800-624-8301, nesc.wvu.edu/drinkingwater.cfm. 36Branched Drain Greywater Systems Art Ludwig. Oasis Design. Design, construction and use of "branched drain" greywater systems: a simple design to achieve automated, reliable subsurface irrigation without pump, filter, valves or surge tank, using all off-the-shelf components. See The New Create an Oasis with Grey Water (book). 37Republic Fastener Products Corp. 1827 Waterview Drive, Great Falls, SC 29055. 800-386-1949. Provides 3/4" 14 gauge steel hog-rings X2RP425 used for all manual hog-ringing with pliers from same supplier. Ferrocement Water Tanks and their Construction, S.B. Watt, printed by the Intermediate Technology Publications, London, UK. Tank Construction Procedures Steve Burgess, Edoret Region Company P.O. Box 6495, Eldoret, Kenya. Fax 254-321-62472. sburgess@maf.org. The Home Water Supply, Stu Cambell. Garden Way Pub, Co., 1983. Cottage Water Systems, Max Burns. Cottage Life, 1993. Country Plumbing: Living with a Septic System, Gerry Hartigan. Alan C. Hood & Company, 1986. Plumbing a House (For Pros by Pros Series), Peter Hemp. Taunton Press, 2001. Water Follies, Robert Glennon. Island Press, 2002. Wells and Septic Systems, Max Alth et al. McGraw-Hill Professional, 1991. Low Dams: A Manual of Design for Small Water Storage Projects, Books for Business, 2001. Welded Steel Tanks for Water Storage, American Water Works Assn, 1984. Quality of Water in Storage Grayman, W.M. and G.J. Kirmeyer. 2000. "Protecting Your Storage Tank - An Analysis of Long- and Short-Term Options", Jacobs, K.A. 2000. In Proc. of the AWWA Infrastructure Conference. Denver, Colo.: AWWA. "Microbial Problems in Treated Water Storage Tanks", Smith, C., and G. Burlingame. 1994. In Proc. of the 1994 Annual AWWA Conference. Denver, Colo.: AWWA.